Last night, I went to my first rugby match and it was truly unforgettable. I was making my way to the Paddo at King George Square Bus Station when I bumped into fellow BISAs Neysa and Kelly. They were decked out in their gear as was I! It looked as if the three of us had been dipped in maroon and mustard yellow paint buckets! We met up with Diego who had reserved us a table. We were so full of energy and ready for our first match. 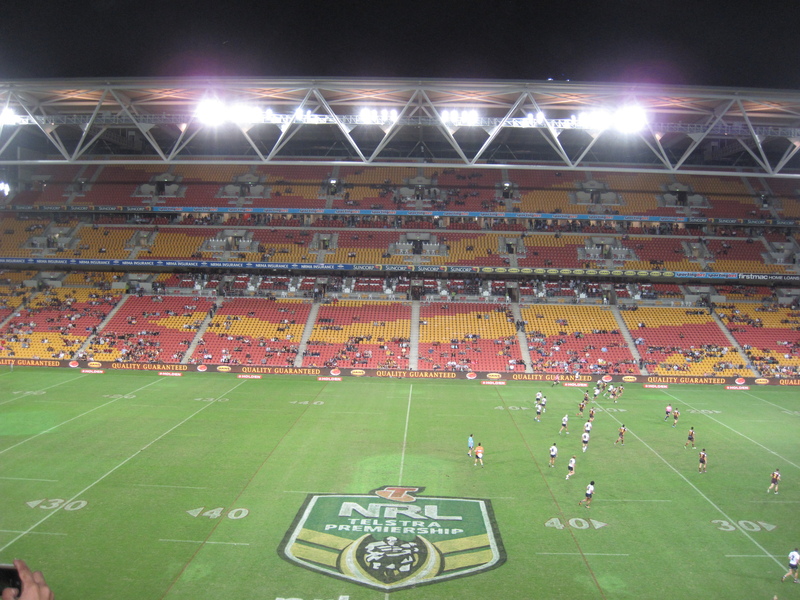 We arrived at Suncorp Stadium early to meet up with our fellow BISAs for our pre-game tour! Then, we were introduced to the Broncos staff who were extremely friendly. They welcomed us by taking us to the CEO Suite for the most amazing view of the field and explaining the rules of rugby to us. I learned that the objective is to score the most points through tries, goals (conversions), and field goals (drop goals) within 80 minutes. There are two halves where they switch sides as well. Each team has six chances to score before having to relinquish the football to the opposition. Tries are the most common form of scoring and are worth four points. A goal is worth two points and a field goal is worth only one point. Passing in rugby league may only be sideways or backward. Teammates can’t move ahead of the player with the football. Tackling is huge in rugby league as well and only the player holding the football may be tackled. 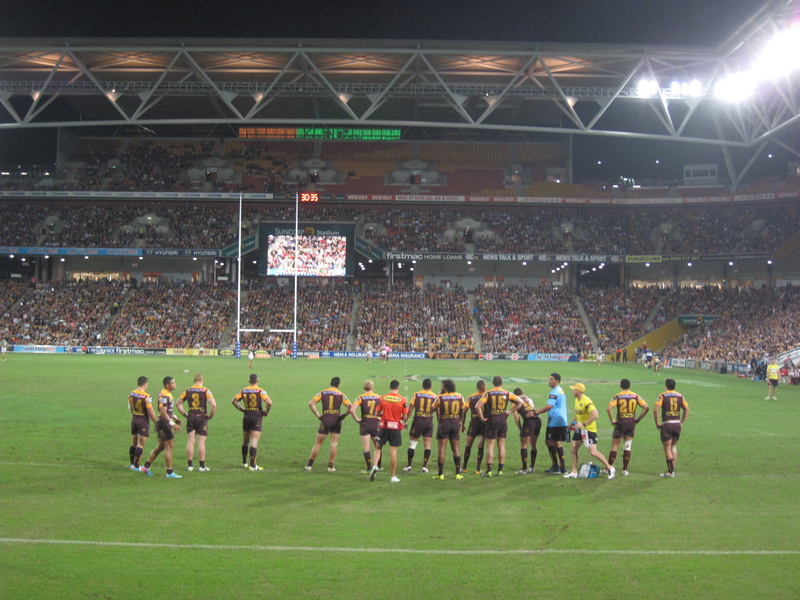 A fun facts about the Broncos is that they have more supporters than any other team in the National Rugby League (NRL) and receive more fans at their matches than any other rugby team in the world (and just gained 33 more fans). We exited the CEO Suite and headed to the field for a sidelines view of the players while they warmed up. Standing so close to the players and taking in the stadium was beautiful. As I watched all of the fans take their seats, the cool wind was hitting my face and I couldn’t help but tippy toe and savor the sweet moment on the field. 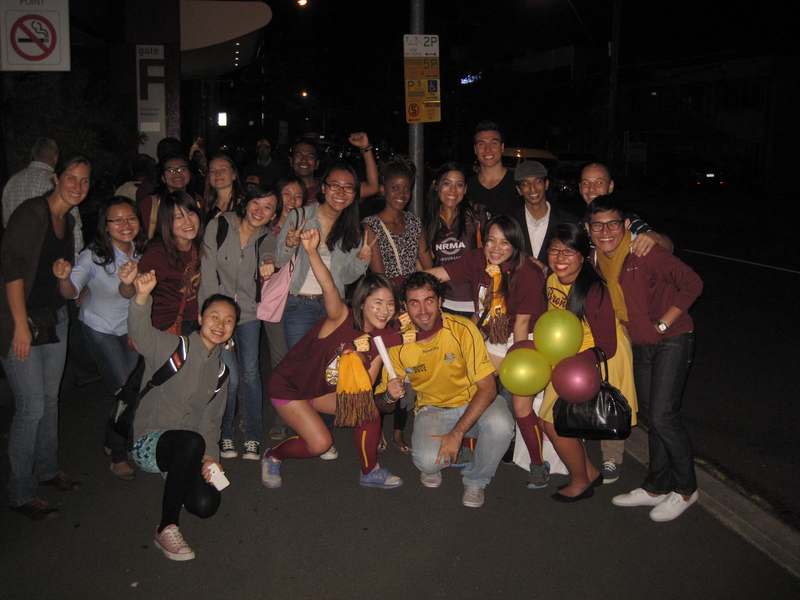 Being a Brisbane International Student Ambassador is going to be an unforgettable journey and this is just the beginning. I thank my stars and appreciate everything that has come into my life. I take nothing for granted and so blessed to share it with my fellow BISAs.